On May 1, 2015, the Access Fund ROCK Project came to Brooklyn, NY to kick off their NYC tour stop. 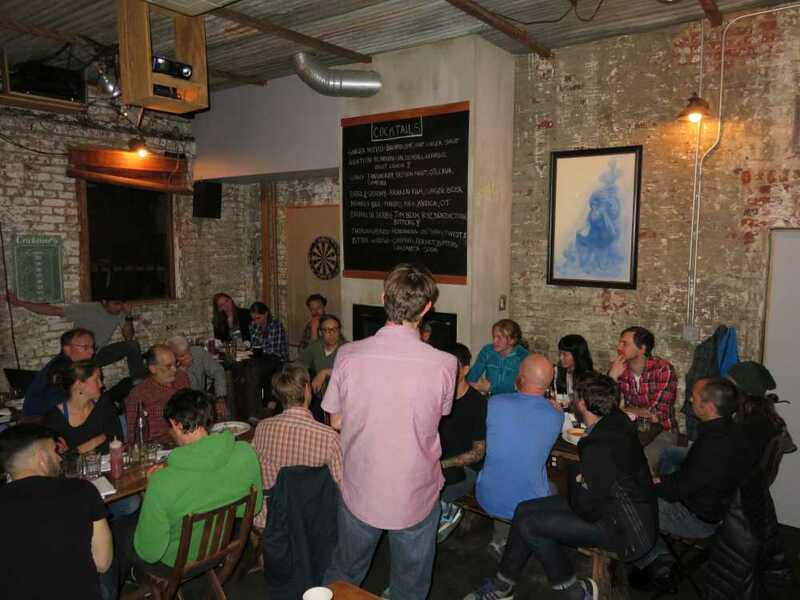 30-40 people met up at the Sheep Station, a bar in the Park Slope area, close to the Brooklyn Boulders climbing gym where the next day clinics and a party would take place. 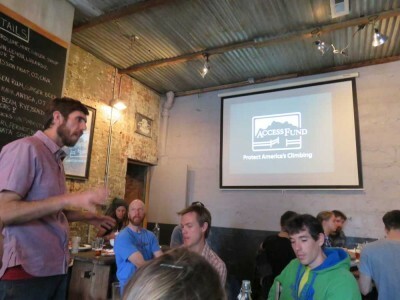 A Roundtable Discussion was had to discuss the challenges and possible solutions to educating the growing climbing population. Travis Herbert, Access Fund Education Director, lays out the plan for the evening. Visible are Chris Schulte, Brady Robinson (Access Fund Exec Director), and Alex Honnold. Representatives from Black Diamond, sponsor of the ROCK Project. my apologies to anyone left off the list. 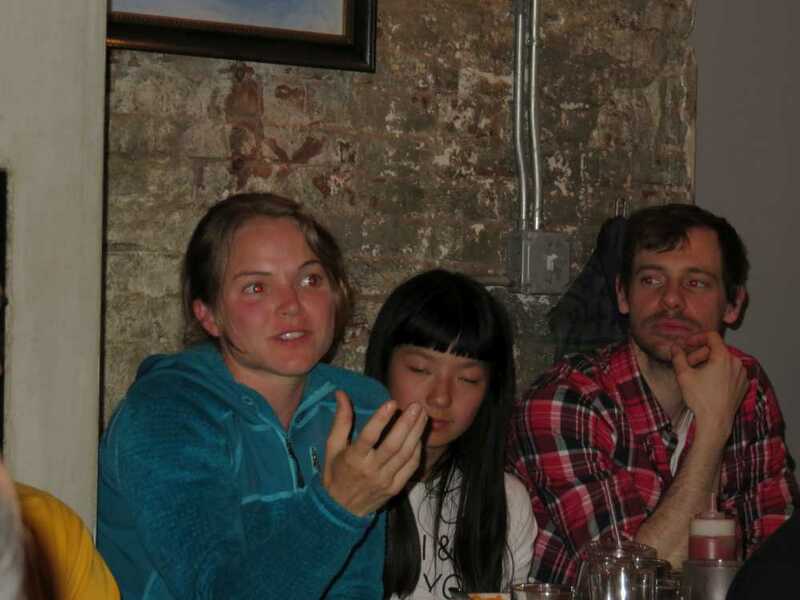 The objective of the Roundtable was to discuss the unique challenges facing the Gunks and brainstorm ideas on how to educate the climbing community, especially new climbers, on responsible and susstainable climbing. One successful social media campaign the Access Fund has promoted is Commit to the Pact, challenging climbers to take responsibility for the places we climb. Use social media to spread the word, and include the hashtags, #committothepact and #ROCKproject. Learn more about The Pact. Commit to The Pact from Access Fund on Vimeo. The Gunks is the closest major climbing area to the greater New York metro area with a huge population of 20 million people. The Gunks is the ONLY major climbing area within a day’s drive of New York City, concentrating so many climbers at one crag. The Gunks is also very popular with hikers, bicyclers and autumn leaf peepers, causing parking lots to fill up in the mornings whenever there is good weekend weather. Many residents of NYC don’t have cars and may not have opportunities to get familiar with the outdoors and appropriate ways to behave (e.g., litter, impact). An example was how people at Coney Island just dump their trash all over the beach, but in the morning someone cleans it all up. Many new climbers aren’t careless on purpose, they just don’t know. Many new climbers learn in the gym and via books. Before gyms and books, climbers learned from mentors who were already familiar with the ethics of the area and the outdoors. Often people with no experience are being mentored by people with not much more experience than they have. The Gunks have an unusually large number of quality climbs with easy grades, attracting more beginners who may not have adequate experience. 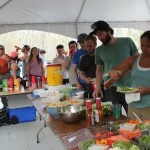 The Gunks are a trad venue, which requires more experience and technical knowledge than bouldering or sport climbing. Two of the hardest climbing women: Angie Payne (1st woman to climb V13), and Ashima Shirasi (1st woman & youngest to climb 5.15) with Chad Foti, founder of the New Paltz Climbers Co-Op. A common challenge is getting up the nerve to say something when we see bad behavior. When it’s definitely a dangerous safety issue, people don’t have a problem saying something. Other issues, like abandoned barking dogs, smoking, or playing music are more uncomfortable for people to speak up about. It was suggested to humanize and equalize – don’t make yourself authoritarian but point out that we’re all out to have a good time and sharing in a positive experience. One person remarked that any time they offered advice at the Gunks, the recipients were very grateful to receive it. They want guidance. Pick up trash while you walk down the trail, those with you or around you will become aware that it’s the right thing to do. Be willing to mentor newer climbers. Show your enthusiasm for the outdoor environment, teach people what the various trees, geology, plants, birds, etc., are so they can start to also feel a connection to the natural environment around them. It’s not just a gym in the outdoors. Be willing to speak up when it’s a safety issue, in a way that’s conversational, not confrontational. Sometimes images can make an impression, e.g., a tree anchor showing the erosion and damage to the roots from impact. People may begin to examine climber impact at every tree anchor after that. 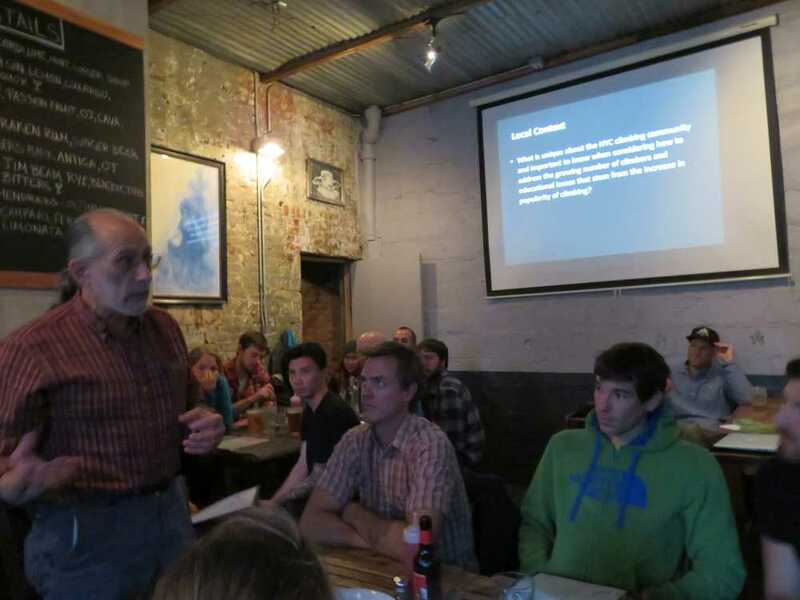 Gunks & Bouldering legend, Rich Goldstone addresses the group. Access Fund exec director Brady Robinson and pro climber Alex Honnold in the foreground. Social media is a great way to get the message out. Between the pro climbers, gyms, Access Fund, landowners, gear companies and climbing coalitions, we can post about being responsible climbers and share/retweet each other’s posts to amplify the message to a greater number of followers. The Pro climbers are “influencers” in the community and have lots of followers on social media, so their participation is very important. Get out the message that you are responsible for yourself. No one is going to clean up your mess for you, no one is going to suddenly appear when you’re in over your head and save you. Professional climbers can emphasize stewardship often in their social media postings & blog posts. Create a stronger connection between climbing gyms and guide services. Often gyms are uncomfortable teaching technical climbing skills (such as anchors) in the gym, and can refer new climbers to guides who can help teach these skills. 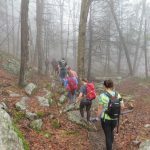 The Gunks Climbers’ Coalition and landowners like the Mohonk Preserve should also participate in educating the gym community and introduce them to the natural environment where they’ll be climbing. Make a presence in the college outing clubs, another source for many new climbers. See something? Say something. Offer guidance. 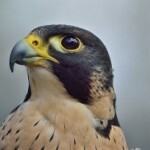 Include education about the natural environment as well as climbing ethics and safety. Help to make climbers feel more connected with nature and more aware of how to protect it. We hope that all of you commit to the Pact, practice responsible climbing, and help educate others so we can keep climbing in the beautiful outdoor places that we love. 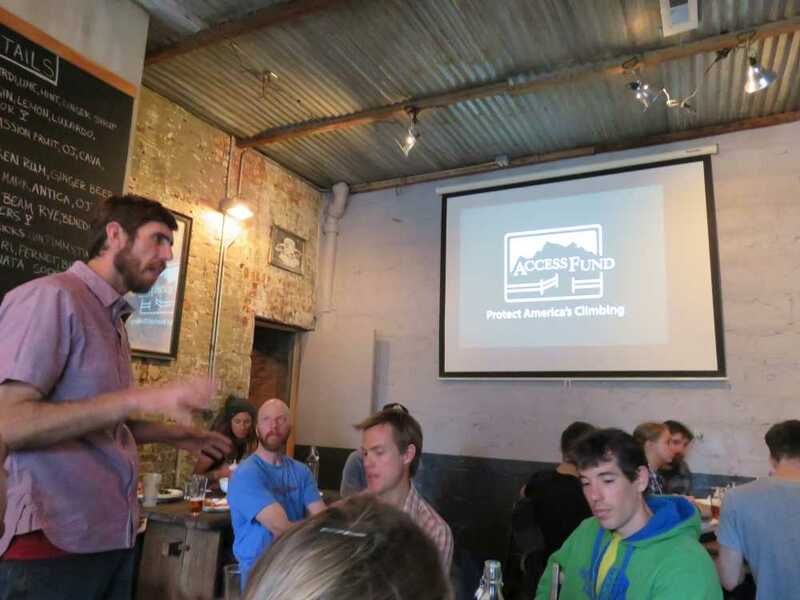 What other issues and education ideas do you have about responsible climbing? Please add to the discussion in the comments.